After you’ve been involved in a car accident, it is very important that you receive all of the medical treatment that you need to get better – even if the other party’s insurance adjuster is telling you that they will not cover it. If you’ve never been involved in a car accident before, this might come as a surprise to you. 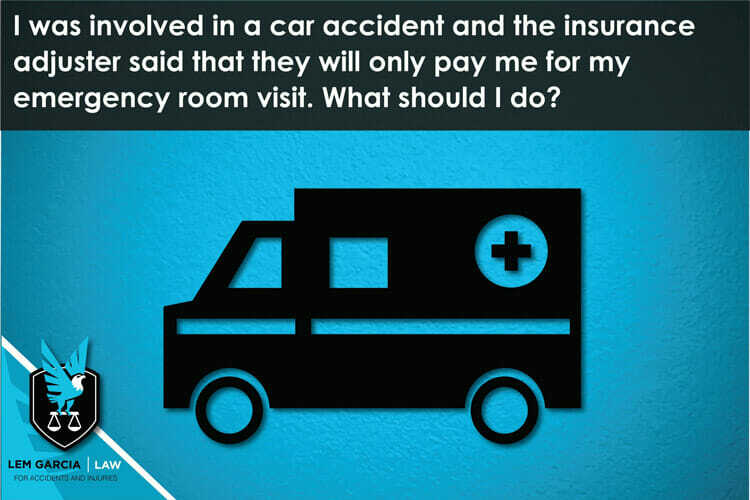 You might be asking yourself, “Why wouldn’t they pay me for all of my medical treatment when the car accident was not my fault? The insurance company’s adjuster is warning you that they will not pay for all of your medical treatment in an attempt to reduce or prevent you from receiving any medical treatment at all for your injuries. Yes, even if you are legitimately injured, the insurance carrier’s adjuster may warn you that they will not all of your medical bills because they want to limit how much they will have to pay for your claim. The insurance adjuster might say that you weren’t hit that hard and/or there is no way you could have been injured from the crash. They also might tell you that they will only cover a few weeks of medical treatment because you should be better in a few weeks. Does that sound fair to you? How would an insurance adjuster who has never even met you know how long it will take for you to get better from your car accident? In reality, nobody really knows how long it will take for you to get better from the injuries that you suffered. Everyone suffers injuries differently after a car accident. There are so many variables that come into play in a car accident, that it is impossible to tell how injured a person is after an accident. Number one, everyone is different. All of our bodies are different. Some are more susceptible to injury and some are less susceptible to injury. Some people heal quickly, and some people heal slowly. Second, all car accidents are different. They happen at different speeds, different angles, and with different types of cars involved. It matters if you were rear-ended while you were driving an old car versus a new car, a sedan versus a truck, or at a low speed at a high speed. Third, the people inside of the cars are also positioned differently. For example, if your head was turned while you were rear-ended, there is a greater likelihood that you suffered a serious neck injury because your neck was in a compromising position at the time of impact. If your head was facing forward and you were rear-ended, there is greater chance that you suffered less of an injury. These are just a few of the main variable that come into play that affect how much a person is injured from a car accident. With so many variables in play, it is impossible for someone to tell you how much medical treatment you will need to receive – especially when they are not a doctor and have never even met you before. If you find yourself in this position, don’t let the car insurance adjuster dictate how much medical treatment you receive. Talk to a personal injury attorney right away. An experienced personal injury lawyer will be able to assess your case and tell you what you should and should not do. Your personal injury lawyer may even be able to help you find doctors in your area that will provide excellent medical care for you – even if you don’t have health insurance. After an accident, you deserve to be taken care. Don’t rely on an insurance company to take care of you. Their job is to make as much money as possible and pay out as little as possible. You deserve better than that. You deserve to get all of the medical attention that you need, have those bills paid for, and you also deserve to get paid for your pain and suffering and lost wages. If you’ve been involved in a car accident, call an experienced personal injury lawyer right away. They’re the ones that take care of you. At Lem Garcia Law, we provide free, no-obligation case strategy sessions to people who have been injured in a car accident. Lem Garcia is a personal injury lawyer in West Covina, but helps injured victims throughout California. Call us today, we’re happy to help.